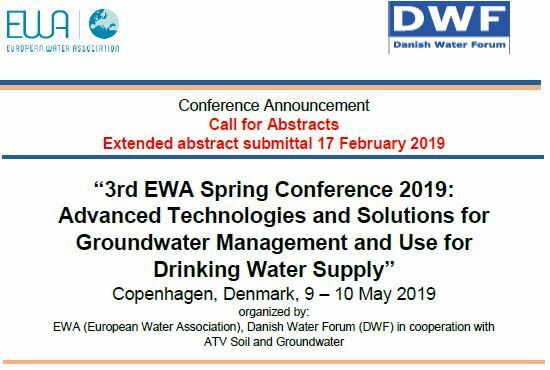 The European Water Association (EWA) Spring Conference organized by the Danish Water Forum (DWF) in cooperation with ATV Soil and Groundwater to take place in Copenhagen 9 – 10 May 2019 herewith invites authors to submit abstracts for oral presentations or posters. We invite all water professionals involved in research and innovation as well as practical demonstration of water solutions within these sub-themes to submit an abstract by 17 February 2019 at the latest. Abstracts must fall within the theme of the conference, and we in particular invite abstracts within the mentioned sub-themes. Presentations should have a European perspective or relevance. Abstracts are to be no more than 250 words long and must be submitted electronically together with a short biography of max. 150 words ( delivered in WORD) to Danish Water Forum clearly marked “Abstract EWA Spring Conference 2019” A final notification as to whether the abstract has been accepted for either oral or poster presentation will be provided by 1 March 2019. There is no limit to the number of abstracts you may submit. Please indicate the preferred platform on the submission form. The allocation of presentations is at the discretion of the Organizing Committee.